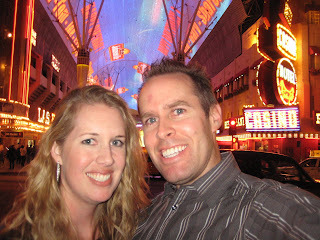 I flew to Las Vegas for Anna's birthday this weekend. We had a room at the Mandalay Bay, my first time staying there. 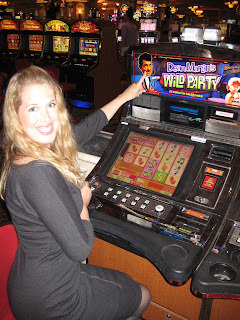 While we waited for her friends to arrive on Saturday, we played Anna's favorite slot machine, Dean Martin's Wild Party. It was a fun game with catchy songs like "Go Go Go Go" and entertaining party sound effects. After winning a nice jackpot with three Dino's, I broke even which was a good sign for the rest of the weekend. 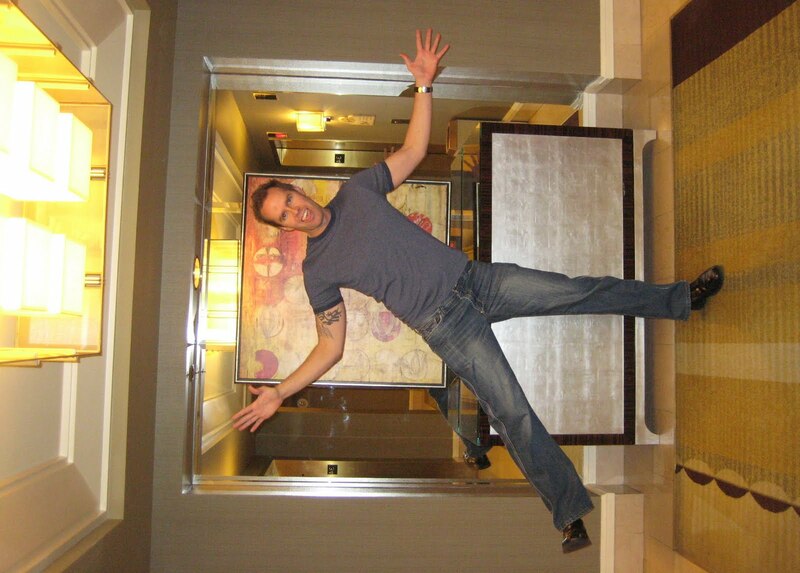 After Michelle and Cote arrived, we met up in their suite with their friends, Rob, Nicole, Ashley, Danielle and Patty. 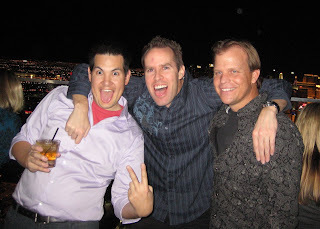 We had a few drinks before all nine of us went to eat at the House of Blues. After changing and meeting back at their room for more drinks, we headed down to the casino where we gambled for awhile and stopped for Vodka Martinis at Red Square. I was real buzzed by the time we headed up to the Mix Lounge at the top of THEhotel. There was a great view of the entire Strip from the outdoor balcony. I had a strong hangover Sunday morning, sleeping it off while Anna headed down to the pool. At noon, the group walked over to CityCenter. It had been under construction the last two times I've visited Vegas, so I was eager to see it. I liked the modern skyscraper appearance of the six towers. Inside the Aria hotel, we had brunch at Julian Serrano, a Spanish tapas restaurant. We all ordered a couple plates to share, including a pitcher of white wine sangria, but I wasn't quite ready to start drinking alcohol again so soon. I ordered the Huevos Estrellados (fried potatoes / eggs / imported spanish pork chorizo) which was the perfect hangover food and the Crispy Pancetta Iberica (pork belly / petit pois puree / molecular mozzarella). The pancetta was Anna's and my favorite dish. The green pea puree was amazing. Anna ordered the Pan Tomate (toasted bread / fresh garlic tomato sauce) and the Pintxo de Chorizos (mini spanish pork chorizo / garlic mashed potatoes / garlic sauce). Dipping some bread in the butter sauce from Michelle's shrimp was heavenly. Everybody finished with some Bunuelos (spanish doughnuts with butterscotch caramel). 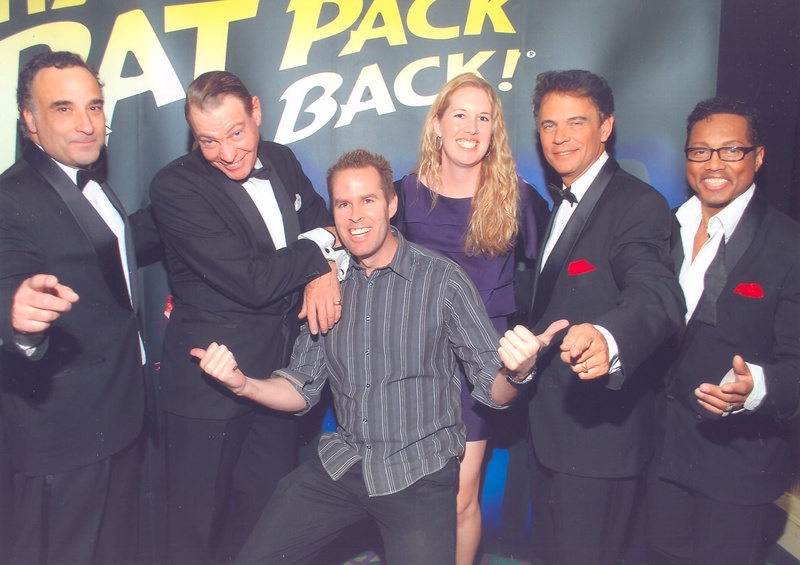 Anna is a big Dean Martin fan, so for her birthday I took her to the "The Rat Pack is Back" show. The Copa Room is at the Plaza Hotel downtown, right next to Fremont Street. The included dinner was not great (bleagh!) but the performance was very entertaining. The Joey Bishop impersonator provided the quick-witted comedy while a 12 piece band backed up the songs from Frank Sinatra, Dean Martin and Sammy Davis Jr. We were sitting right up against the stage and it felt like the classic representation of a Vegas show you might see on a sitcom episode. 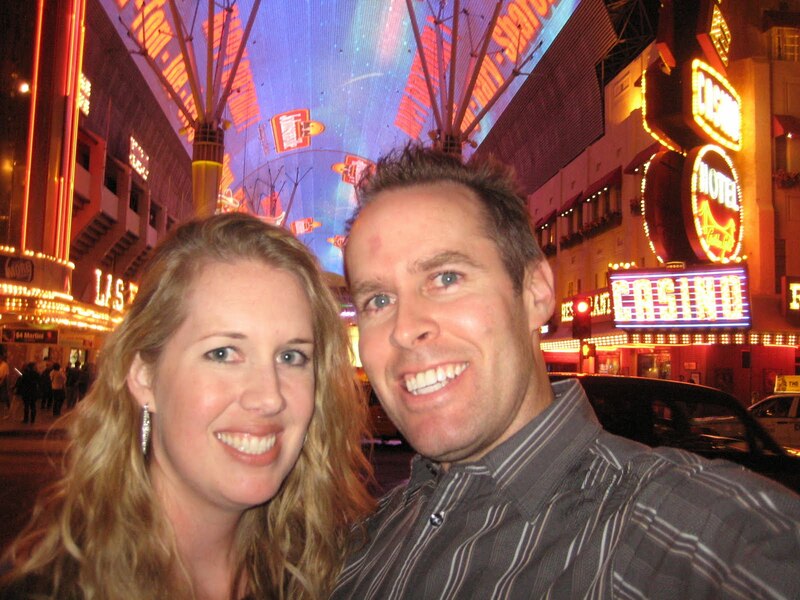 After walking down Fremont Street and playing some slots at the renovated Golden Nugget (very nice), we went to The Cosmopolitan hotel that opened last year. Inside, we met up with Michelle, Cote, Rob and Danielle at The Chandelier, a three-story bar encircled with thousands of hanging crystal strands. After a few drinks, like a Burnt Campfire with a chocolate graham cracker rim and a toasted marshmallow, we gambled until 2am. I really enjoyed the Star Wars Droid Hunt slot machine, the movie clips were entertaining and Cote and I kept winning extra cash from the frequent bonus games. Monday was Anna's actual birthday so the two of us went to lunch at Fleur by Hubert Keller. I have wanted to go to one of his restaurants since seeing him on Top Chef Masters. We both started with the Caesar Salad (toad in a hole / fontina / truffle) that had the most flavorful croutons ever. All the plates are small so we both had two additional dishes. Anna had the Gnocchi (san marzano fondue / pesto) and the Chicken Croquettes (upland cress, garlic cream, pine nut) while I had the Croque Monsieur (smoked ham / gruyere / bechamel) and the Angus Sliders (blue cheese, onion, bacon, pear). Everything was so rich and delicious, but never overwhelming to the taste buds. The only thing I was unhappy about was the markup on the Red Bull. $8!!!!! Since our flight home wasn't until 8:30pm, we spent more time partying with Dean Martin's slot machine. Anna won over $10 and I got back the $30 I had lost the night before. Except for losing twenty while playing craps with Anna (her first time), I came out even with my gambling this trip. In the afternoon, we spent some time at the Bellagio watching the water show and having a drink at the Petrossian Bar before heading to the airport. A Very Fun Trip! p.s. I placed a $20 bet for San Diego State to win the NCAA Basketball Tournament. I got my ticket at 22/1 before the SDSU vs. BYU game on Saturday. After San Diego State won, the odds dropped to 16/1 and then down to 12/1 when they were officially selected as a #2 seed for the tournament bracket. That means if they win, I earn an extra $200 by betting early. Go Aztecs!